La Riche Directions Hair Dye There are 72 products. Get a delicate and bright new hair colour with the La Riche Directions Semi-Permanent Hair Dye in Carnation Pink! Switch up your style in an instant with the La Riche Directions Semi-Permanent Hair Dye in Cerise Pink! Give your look a proper shake up with the La Riche Directions Semi-Permanent Hair Dye in Mandarin! For a diverse range of amazing colors and shades, you simply have to check out our huge selection of La Riche Directions hair dye. With a large variety of colors, pack sizes and handy lightening kits, all styles are catered for when you shop for Directions hair products. The brand has been releasing their unique colors since 1981, so they certainly know a thing or two about switching up hair styles! The range of La Riche directions hair colors have been highly popular ever since and has been used in some of the hottest styles and trends. Loved by celebrities and fashion fanatics it’s certainly a hair dye brand worth trying. Red – If its fiery shades that you’re searching for, La Riche has plenty of colors to get your new style ticking! There are loud shades of Pillarbox Red and Fiery Red which are sure to flaunt your ferocious style, or the muted Poppy Red and Rose Red will create a sharp red glow to any look! Purple – The versatility of purple shades is exemplified in this selection. 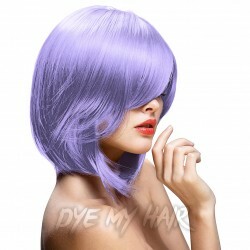 The light Lavender and Lilac shades are ideal muted tones which contrast with the punky shades of vibrant violet. It’s possible to achieve a refined and retro look with deep shades of Plum and Dark Tulip. Blue – It is way too easy to get lost in a deep shade of blue hair dye. La Riche has a huge range of soft pastel blues and aqua tones such as the Lagoon Blue or Turquoise. The darker shades of Atlantic Blue and Midnight Blue are the perfect way to add a crisp and cool finish to your look. Ammonia Free – used in some more permanent hair dyes, ammonia can be damaging to the hair as it can penetrate deeper into the hair shaft. This makes the hair weak and brittle, so ammonia free products reduce the risk of damaging your hair dye during the dye process. Peroxide Free – peroxide is another chemical used in hair dyes which can be detrimental to your overall hair health. When used in excess, peroxide can have a corrosive effect which leaves hair weakened. As long as you follow Directions hair dye instructions your hair should remain healthy and strong. PPD Free – the chemical para-phenylenediamine can sometimes appear in hair dye products. In some cases, it can cause skin irritation and allergic reactions. Being PPD free, La Riche hair dye products are less likely to cause reactions on the scalp or surrounding hair areas. Not Tested On Animals – with a strict and ethical policy on using animal testing for their products, you can color safely with La Riche Directions knowing that the products are entirely cruelty-free. When you shop with Dye My Hair, you can be sure to find all kinds of La Riche products, including kits and toner. We think we are sure to become your favourite Directions hair dye stockists. If you have never tried hair dye before then why not pick up a single pot to test the waters? However, if you can’t get enough of one of La Riche’s awesome color or need multiple pots to achieve full coverage, we also sell multipacks of four tubs so you can save whilst achieving your favourite styles for longer. As well as the hair dye itself, you can pick yourself up some La Riche Directions Color Hair Dye Kits which make home hair dyeing a complete walk in the park! Each essential kit comes with tint brushes, protectable gloves, development cap, tub of hair dye, shampoo and color protecting shampoo and conditioner. With this kit you’ll be well on your way to change up your ‘do without expensive trips to the salon. Want to know how long does Directions hair dye last? It lasts up to 6 weeks so you can enjoy a summer with bright hair or can frequently change your style! It can sometimes be hard for those of you with naturally dark hair to successfully utilise some of the brighter shades of hair dye such as Directions hair dye silver. But fear not, La Riche has you covered with their hair lightening kits! Designed to make dark hair light enough to sport brighter shades, these packs ensure everyone can achieve those awesome alternative hair looks. Each kit comes with a powder bleach sachet, a bottle of cream peroxide, application brush, mixing tray, a sachet of moisturising shampoo, pair of medium plastic gloves, and development cap. With a whole heap of new shades to try out, we think you’ll find everything you need when you choose La Riche Directions hair dye. Get all your accessories in one place and discover a brand new color. The beauty of Directions hair color is you can achieve both fun, quirky colors and sophisticated, chic styles!